I never thought I would pour extra virgin olive oil over my vanilla ice cream. Adding basil? Not a chance. But this was surprisingly delicious! I was inspired to add the basil by Ree Drummond on her show The Pioneer Woman on Food Network. She had this delicious looking recipe where she topped her vanilla ice cream with peach syrup and basil so I just had to try basil on my ice cream. While suffering from a UTI turned kidney infection I learned that one of the things that supposedly helps your kidneys is extra virgin olive oil. If you have kidney stones some people recommend drinking olive oil by itself, but I could not get myself to do it. So I thought I would drizzle it on my ice cream. I figure if Salt & Straw’s Arbequina Olive Oil ice cream was one of Oprah’s favorite things adding olive oil couldn’t be that bad. Ooh la la it was good! 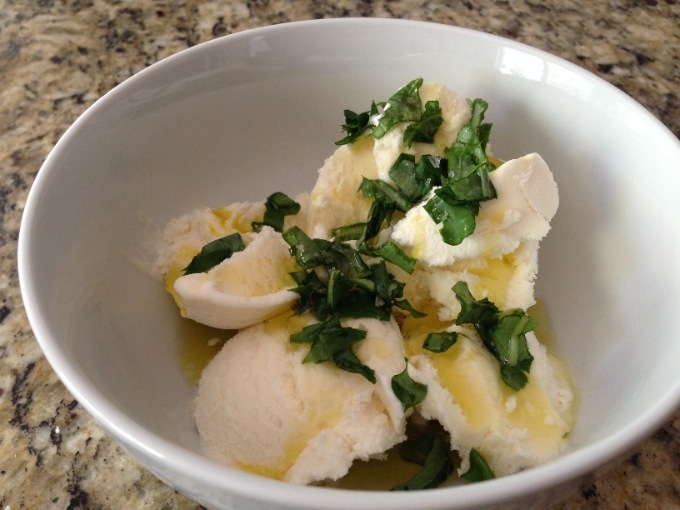 So next time you are getting bored with your vanilla ice cream try it drizzled with extra virgin olive oil and fresh basil. You might just like it.